1. Description: On a bronze medal, 1 ¼ inches in diameter, an oriental dragon behind a grove of bamboo trees above the inscription "REPUBLIC OF VIETNAM SERVICE." On the reverse, a crossbow surmounted a by a torch above the arched inscription "UNITED STATES OF AMERICA." 2. Ribbon: The ribbon is 1 3/8 inches wide and consists of the following stripes: 1/8 inch Primitive Green 67188; 5/16 inch Air Force Yellow 67103; 1/16 inch Old Glory Red 67156; 5/32 inch Air Force Yellow; center 1/16 inch Old Glory Red; 5/32 inch Air Force Yellow; 1/16 inch Old Glory Red; 5/16 inch Air Force Yellow; and 1/8 inch Primitive Green. (4) Serve on temporary duty for 30 consecutive days or 60 nonconsecutive days in Vietnam or contiguous areas, except that the time limit may be waived for personnel participating in actual combat operations. b. Individuals qualified for the Armed Forces Expeditionary Medal for service in Vietnam between 1 July 1958 and 3 July 1965 shall remain qualified for the medal. Upon request, the individual may be awarded the Vietnam Service Medal in lieu of the Armed Forces Expeditionary Medal. In such instances, the Armed Forces Expeditionary Medal will be deleted from the list of authorized medals in the individual’s personnel records. No person shall be entitled to both awards for Vietnam Service. 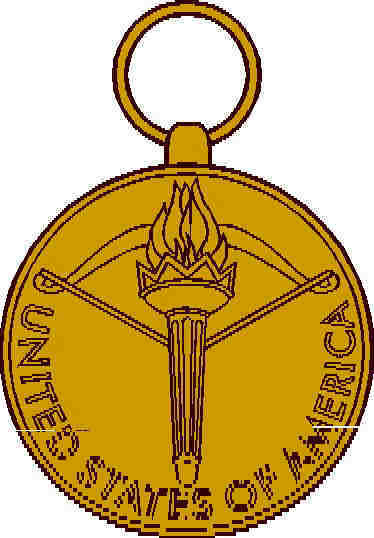 a. Medal (regular size): MIL-DTL-3943/230. NSN 8455-00-926-1664 for set which includes a regular size medal and ribbon bar. b. Medal (miniature size): MIL-DTL-3943/230. Available commercially. c. Ribbon: MIL-DTL-11589/151. NSN 8455-00-926-1530.
d. Lapel Button (metal replica of ribbon bar): MIL-L-11484/69. Available commercially. e. Streamer: MIL-S-14650. Manual requisition in accordance with Chapter 9, Army Regulation (AR) 840-10. 5. Background: a. On 21 August 1964, the Deputy Chief of Staff for Personnel (DCSPER) requested that The Institute of Heraldry provide proposed designs for the possible adoption of a Vietnam Service Medal. Proposed designs were submitted to DCSPER on 29 September 1964. The Vietnam Service Medal was established by Executive Order 11231, dated 8 July 1965. The design approved by the Office of the Secretary of Defense, 12 July 1965, and the policy for award was promulgated by DOD Directive 1348.15, dated 1 October 1965.
b. The design, created by Miss Mercedes Lee, includes bamboo trees which are adapted from the flag of the President of Vietnam and the half-concealed dragon represents the subversive nature of the conflict. The crossbow, on the reverse, is the ancient weapon of Vietnam and the torch of the Statue of Liberty is a symbol of the United States devotion to liberty and freedom. The yellow ribbon with three vertical red stripes suggests the color of the flag of the Republic of Vietnam. The green border on each side alludes to the jungle of that Country.